One of my favorite places to eat growing up was a small teriyaki hut just outside of Downtown LA. Spending lots of summers in Hawaii, I was used to eating plate lunch. 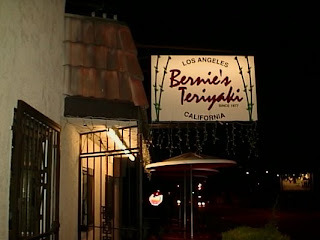 But at home, there wasn't anything close, except for Bernie's Teriyaki. Bernie's is one of those places where the food/recipes hasn't changed in years. It tastes the same as it did back in the late 1970's. The taste and smell reminds me of the church fundraisers in Hawaii selling Huli Huli Chicken, but can't find anything close to it these days. Took a break from all of the gourmet food that I've had in the last week. 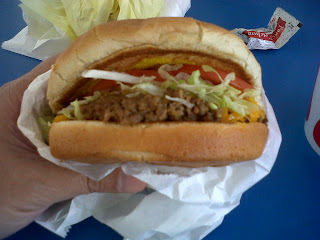 So today, Jeff Nitta (not on Twitter) and I had our weekly meeting at "Rick's Drive In" in Pasadena. We tried the "Taco in a Bun" and Spuderito (a burrito with French Fries). I was reading Nonstop Honolulu the other day and came across Mari Taketa's (@nonstopmari) "What is it about saimin?" Saimin is a noodle soup unique to Hawaii with Japanese, Chinese, and Filipino ingredients. Spending a lot of summers in Hawaii with my grandparents, I grew up with saimin and still love it many years later. Although there aren't really good saimin places in Southern California, I had to look for a noodle place that would satisfy my urge for this local favorite. A Tuna Good for the Environment? A few of you have asked for additional information on Kindai Bluefin Tuna as mentioned on an earlier post. 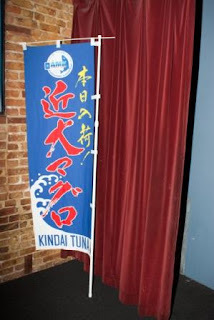 My friend Jeff Nitta introduced me to Kindai Tuna at an event a few years ago. After hearing about the plight of the Atlantic Bluefin Tuna, I knew that I had to stop eating wild bluefin tuna while the tuna population regenerates. I haven't had any wild bluefin tuna in years. 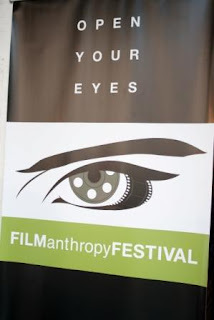 The FILManthropy Festival educates, inspires, motivates, and raises the awareness to forgotten or unknown issues, such as wild bluefin tuna, through a variety of films. Thank you to the Sirens Society for helping to educate at the festival. A long long time ago, in a galaxy far far away, I started my career working for a major Hollywood studio. While there, I was fortunate to screen a lot of films during my 10 years in the industry. I still love films and filmmaking, so when my friend Jeff Nitta introduced me to the Sirens Society and heard about their festival and giving back, I knew I had to attend. You see, the Sirens Society promotes philanthropic activities within the community and their FILManthropy Festival actually "OPEN YOUR EYES" to some great films but also to raise awareness to unknown issues. I saw some great films, met some AWESOME people, had some wonderful food, and made a difference in many lives too. I know the money raised will help a lot of people. Last Saturday was the Long Beach Street Food Festival. Wanted to try a couple of the trucks that I haven't been yet, so I got up early and headed to Long Beach. Just a quarter of the line for Nom Nom, they had the longest line I spent about 3 hours and we hit 4 trucks, considering I wasn't that hungry, not bad. The food was pretty much what I had thought, but I'll have to go back for the Korean short rib tacos at Bool BBQ. It was a nice way to spend a Saturday lunch! 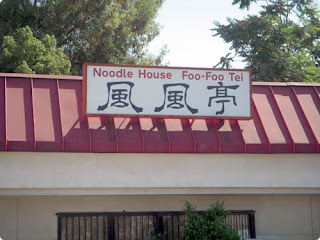 On a recent trip to the Bay Area, my friend Curtis suggested that I try this pho place. Pho is a Vietnamese rice noodle soup, with either beef or chicken, and served with garnishes and a variety of sauces. Curtis mentioned that the place he wanted me to try is a Northern Vietnamese style pho place in San Francisco called Turtle Tower, which really intrigued me. I was wondering what the difference was between this Northern style and the style that I was familiar with? I asked around and not many knew the difference, hence this blog entry. 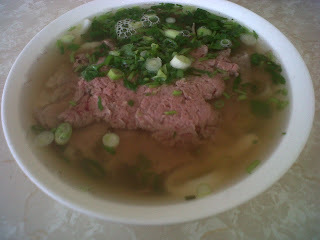 The style of pho that I'm most familiar with is the Saigon style (Southern Vietnam). This style uses a noodle similar to the size of linguine and served with a variety of garnishes: bean sprouts, cilantro, Thai basil, sliced jalapenos, limes, chili sauce, hoisin sauce, etc. Have fun making handrolls for your next party.